You’ve been waiting for months, and it’s finally here! Season 2: Chapter 1 (along with a preview of Chapter 2). The Missions Section has been completely overhauled. “Story” has now been renamed “Season 1”. While functionality for the Season 1 and Spec Ops tabs remain the same, there is a new “Mission Info” tab that will give you information on a per-mission basis (previously only available at the Chapter level). You also will notice icons that show you if there is an Epic Boss available in a Chapter. *NEW* Incursions - Complete every Incursion event in all 6 missions. Incursions are battles where you fight agents and teams from other realities, protecting your own! While it is similar to PVP, you are able to change your team and these battles do not use PVP hero bonus or Armory bonus. *NEW* Heroic Battles - Complete every Heroic Battle event in all 6 missions. Heroic Battles are combat events where the agent is usually not available and the focus is on classic mashups between specific heroes and villains. You are required to own the heroes who the story focuses on. Challenge Modes - Complete challenge mode for all 6 missions. Epic Bosses - Find and defeat all of the Epic Bosses in the chapter. While there used to generally only be one per chapter in Season 1, Season 2 chapters will have more than one. Look at the mission icons to see which missions feature an Epic Boss. Chapter Mastery Rewards are no longer going to be golden weapons. Instead, we’re going to be giving players brand new hero uniforms. Chapter 1 will feature the new Heroic Age Iron Fist! Completing the Chapter Mastery will unlock both the scrapper and bruiser versions of this uniform. 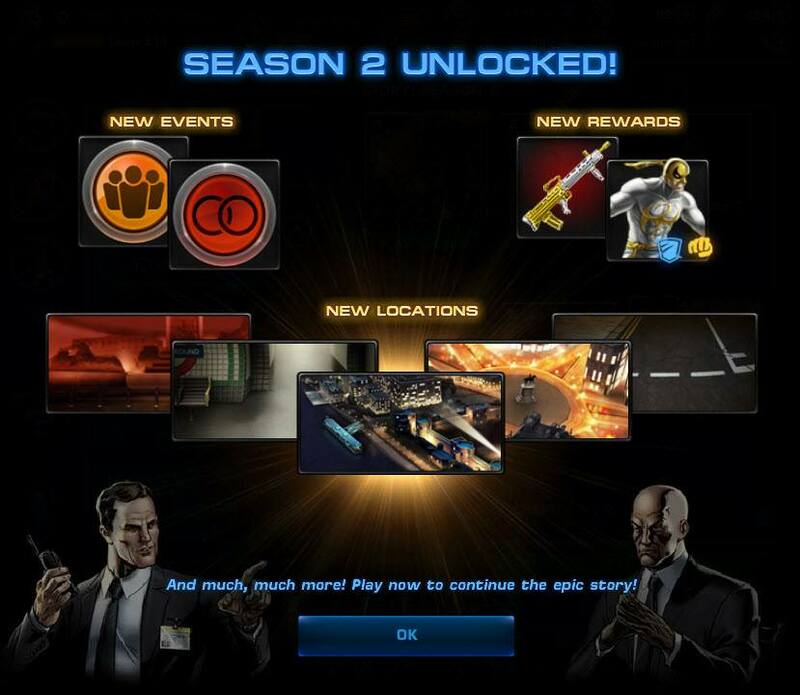 Chapter Difficulty for a Season 2 mission is set at your level the first time you play the mission! Also, all gear rewards in Season 2 are customized! We feel this will provide a greater sense of challenge and fun to all players, regardless of their level. The Chapter Info screen has been updated to show each of the rewards you get for completing each of the Chapter Mastery sub bars as well as the Chapter Mastery bar. These are also shown in tooltips when you hover over the bars. Sugar Man - The monstrous Sugar Man comes from an alternate reality where the mutant tyrant Apocalypse conquered North America. A slaver and geneticist, he performed hideous experiments in a Seattle prison camp before escaping to our world. Selene - Selene Gallio can psionically drain the life force of others, rejuvenating herself and controlling her victim's mind. She has used this power to live for thousands of years, all the while cultivating her mastery of dark sorcery. These are two of many new favorite Marvel villains to come! We are working closely with Marvel and MAA writer Alex Irvine on a new story for Season 2 that has close ties to the story being told in the Avengers and New Avengers comic series regarding Incursions. However, prior knowledge from the comic books is not needed as our Marvel Gaming Universe version of the story is stand-alone and unique. For all of the comic book fans out there, especially fans of New Avengers, check out the watermark behind the Season 2 tab. It’s Black Panther discovering the first known Incursion in Wakanda. The task system has been totally overhauled to be more fluid and support different types of tasks in the future. The task icon has been updated to be more consistent with the new UI for Season 2. It is now a blue briefcase (which is also the icon for the task sub bar of Season 2 Chapters). There are now arrows that allow you to scroll through your entire task list with ease without opening the task bag. However the task bag is still available if you’d like an overview of all your tasks. The Research section now is sortable to help you find the things you’re looking for. We have added over 100 new sound effects to the game to make combat sound totally awesome! Not only that, but we know people were tired of the same two songs over and over in the game. We’ve now added over 10 music tracks to the game that weren’t there before. In an effort to bring attention to this update, everyone’s sound toggle has been reset to “On”. You are welcome to turn it back off, but we ask that you give it a chance and let us know how you like it. On the Team Page you can now scroll through all of the moves of characters who have more than 4 moves. Check out Punisher, Vision, Omega Sentinel, and Cable on the team page and use the arrows on the lower-right corner to scroll through their move list. We are slowly rolling out the previously-announced “Collect and Resend” button on the flight deck. If you do not have the feature yet, be patient. It will be coming to everyone soon. I haven't completed season 1, i'm currently playing at level 56, should i play season 2 or not. How to win this Iron fist's uniform?